The wheels seem to be in motion for Apple to begin updating its MacBook offerings during the second quarter of 2016, with resellers holding firesales on all 2015 MacBook Airs while Best Buy has halted sales of current-generation 12" MacBooks completely. Following a five-week sale, Apple authorized reseller Best Buy has stopped selling Apple's current 12 inch MacBook, according to people familiar with the matter. They say that each of the 2015 models are currently listed as "Discontinued" in the reseller's ordering system. A quick check of AppleInsider's Mac Price Guide seems to corroborate this information. 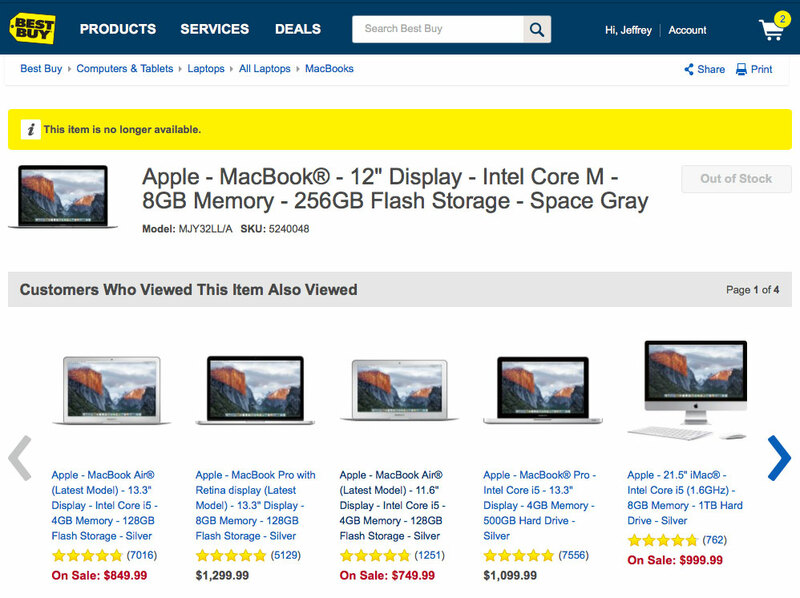 Every model is listed as "sold out" and Best Buy's product pages for these items each read: "This item is no longer available." Historically, Best Buy has only used this wording when a current generation product has been discontinued, either permanently or in preparation for a refresh. A similar trend can be seen over at MacMall, where only 4 of 12 models remain available. The remainder do not have ETAs. Meanwhile, both B&H Photo and Best Buy have knocked practically all of its 2015 MacBook Air inventory down to the lowest prices ever seen with models starting at just $749.00. B&H began the process late last week and Best Buy picked up the effort in earnest on Sunday, slashing prices across its 2015 MacBook inventory. Information suggests that Apple is most likely to continue rolling out modest performance upgrades (or "speed bumps") to its existing 11- and 13-inch MacBook Air designs in the short term, before eventually fading the product line out in favor of sleeker, more cutting-edge MacBook models that will eventually come in display sizes greater than 12 inches. In terms of where Apple may take the existing 12" MacBook, recent rumors have pegged a model with a slightly different hinge design for the back half of 2016, suggesting any earlier refresh would largely consists of performance and spec increases to the existing design. While garnering praise for a stunning, lightweight design, the existing 12" MacBooks have been a pin-cushion for critics of its wimpy 1.1GHz Core M microprocessor and sub-par 480p FaceTime camera. While some —or all —of these refreshes could materialize quietly in the weeks ahead, Apple's Worldwide Developer Conference could serve as an alternative platform for the company to kick off its 2016 Mac product introductions. Apple has historically held that conference in early June but held off on formally announcing the conference dates until just a few weeks prior.